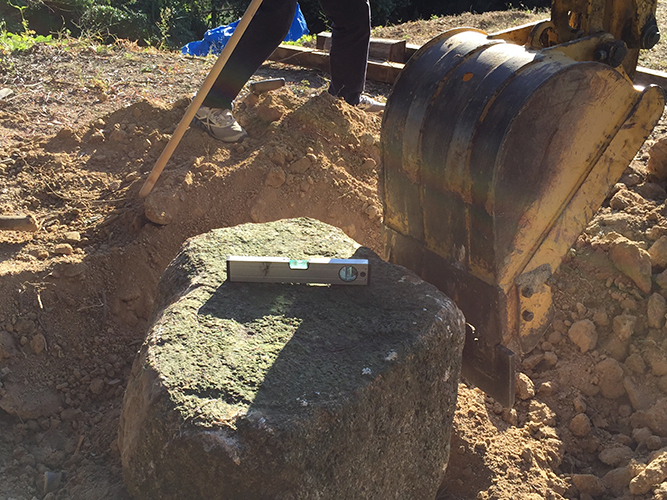 On October 26, I headed to Maejima with the stone that was loaded in my car three days ago in Sekigahara. Henceforth, my mother and I would spend a little over two months making two trips a month to Maejima. 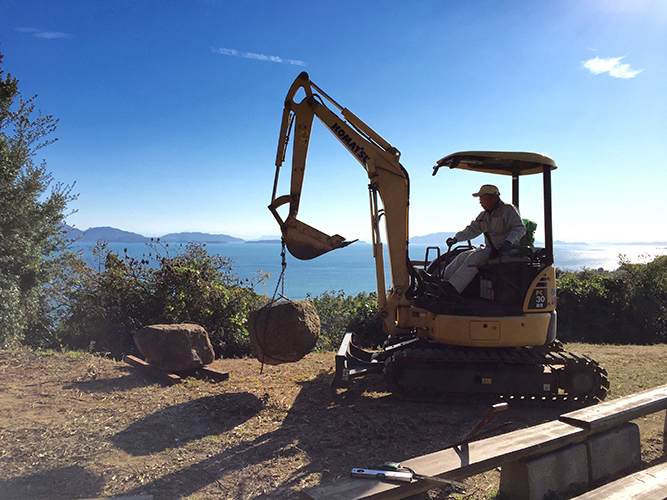 engineering and construction, is maneuvering the backhoe. 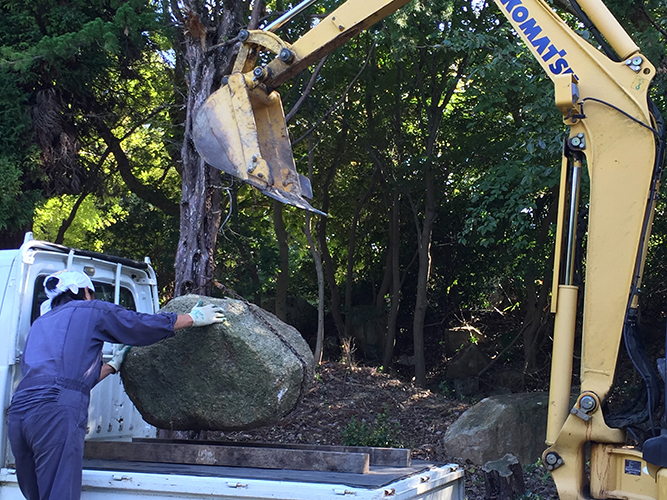 Upon my arrival in Maejima Camp, I was greeted with quite a surprising sight of a backhoe lifting up a large block of granite about to be loaded onto the back of a pickup truck. 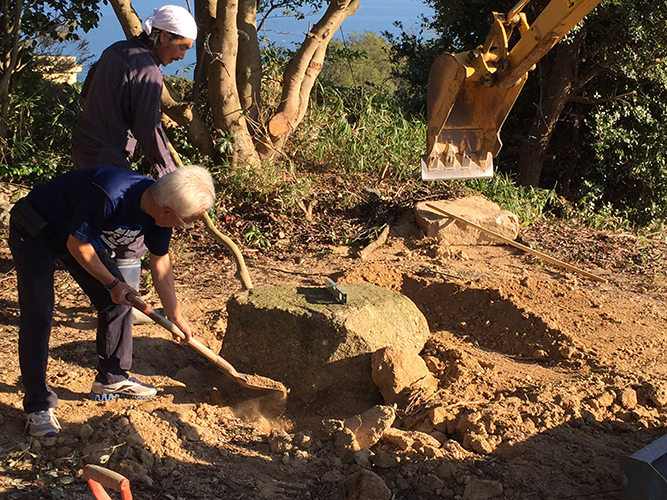 In Maejima, there is an abandoned quarry, stones from which were used on the wall of Osaka Castle. 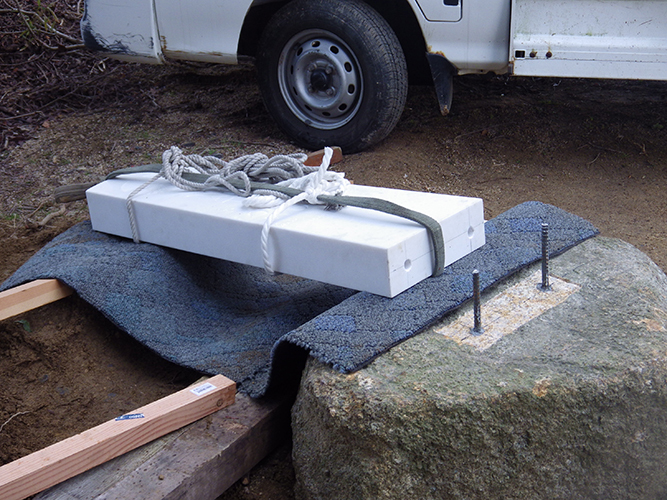 There are quite splendid pieces of granite on the grounds of the camp as well, so I had requested to use one of them. Mr. Motohama had selected one that would be appropriate for the base stone of the memorial. 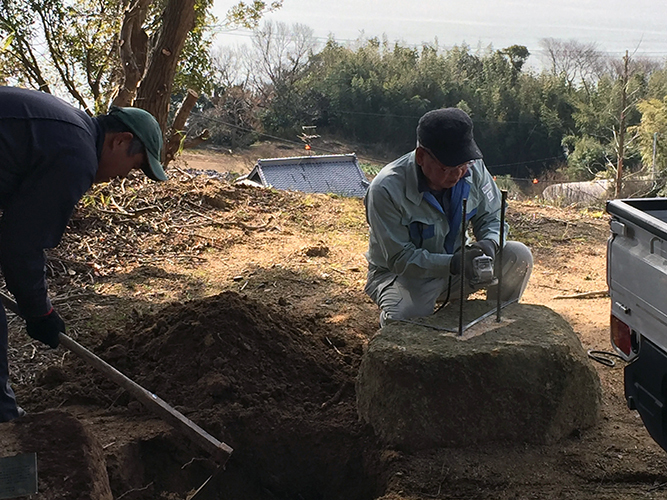 So on that sunny autumn day, I got to watch the base stone being set up on the ground. 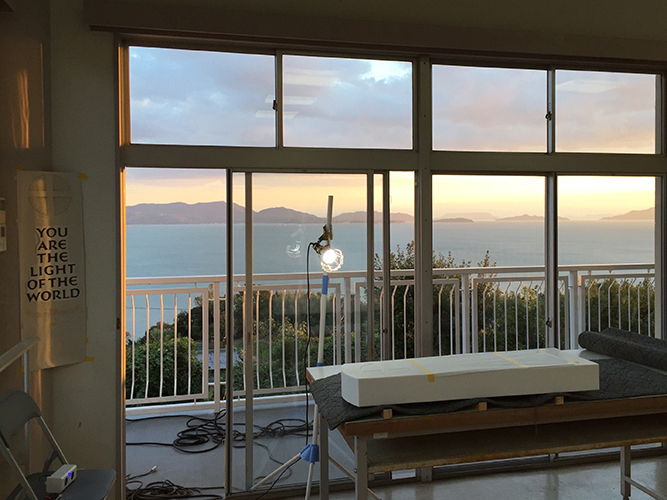 Then it was time to carry the marble to the second floor of the cafeteria building, where I would be working. 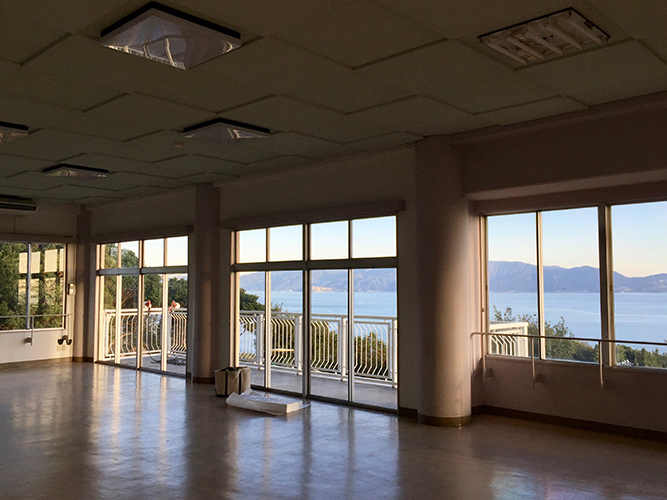 Maejima Camp's large cafeteria was to become my workspace. The stone on a wheeled platform was brought safely to the second floor using a dumbwaiter. 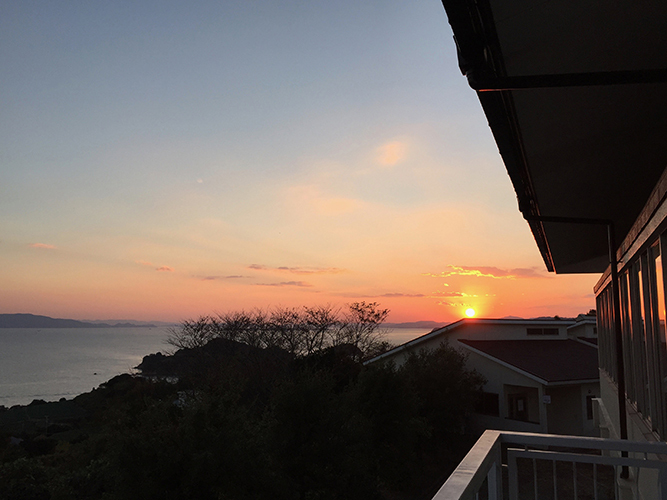 A breathtaking view of the islands and the Seto Inland Sea unfolded before me from the balcony of the cafeteria. I was to begin working in front of this ever-changing scenery. 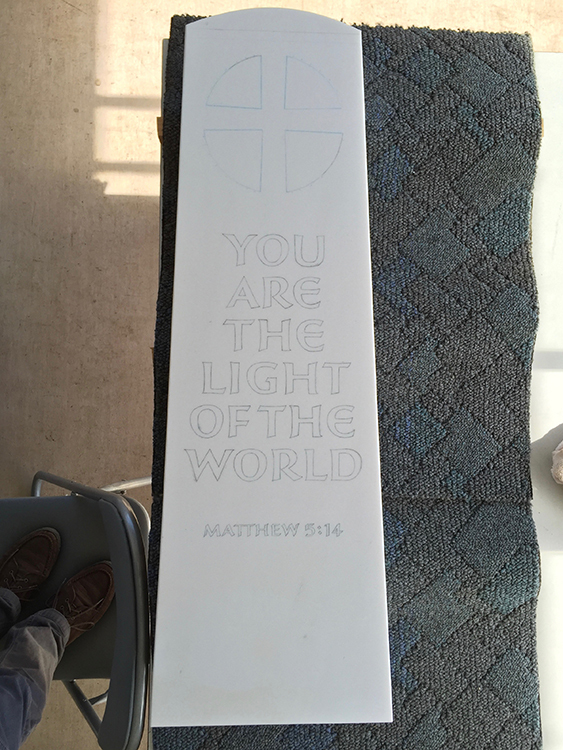 The stone was set at the corner of the cafeteria, closest to the Hill of Prayers. 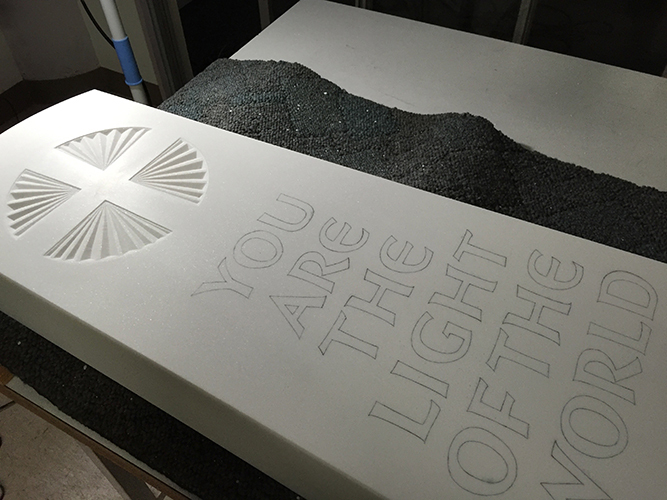 With Mr.
After tracing the front design onto the stone, I started working on the cross design. 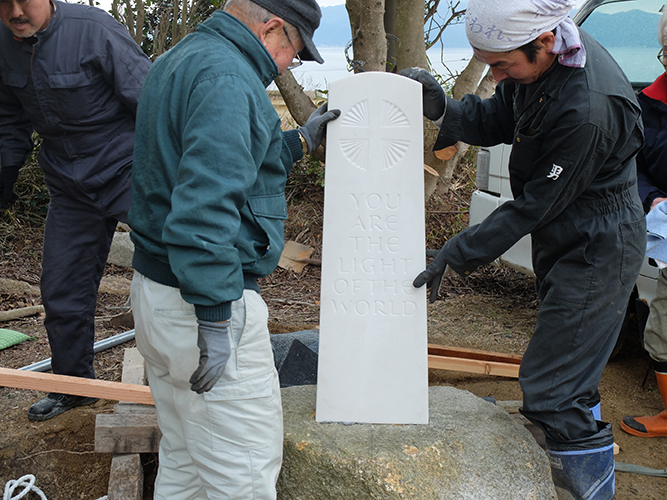 The stone was laid flat, which was fine until I finished carving the cross. However, I was anxious about the process that would follow. 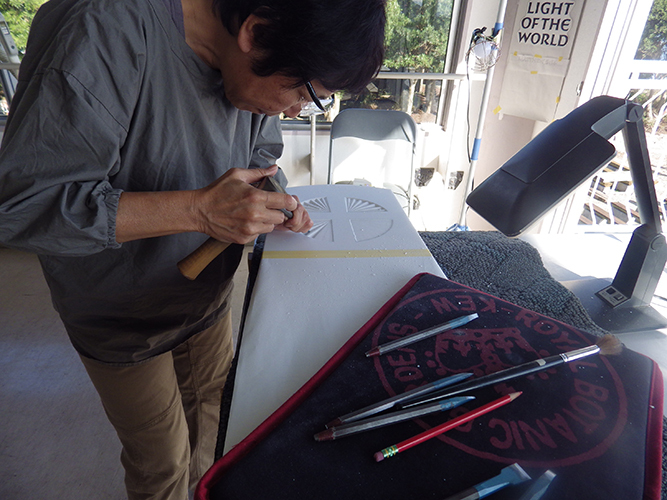 In order to v-cut letters on a stone, the stone is normally set up on an easel, but obviously I was not going to be able to work on the easel that I usually use. Thinking that it would somehow work out, I had postponed addressing the issue. 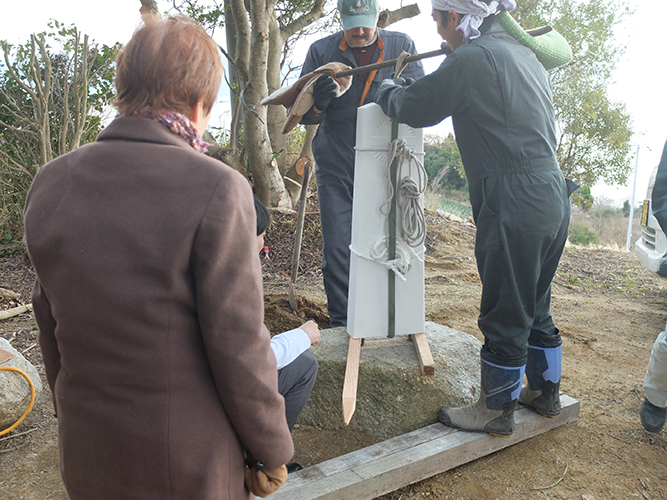 That day, an islander who had heard of the memorial, offered to make a stable platform that would serve as an easel. 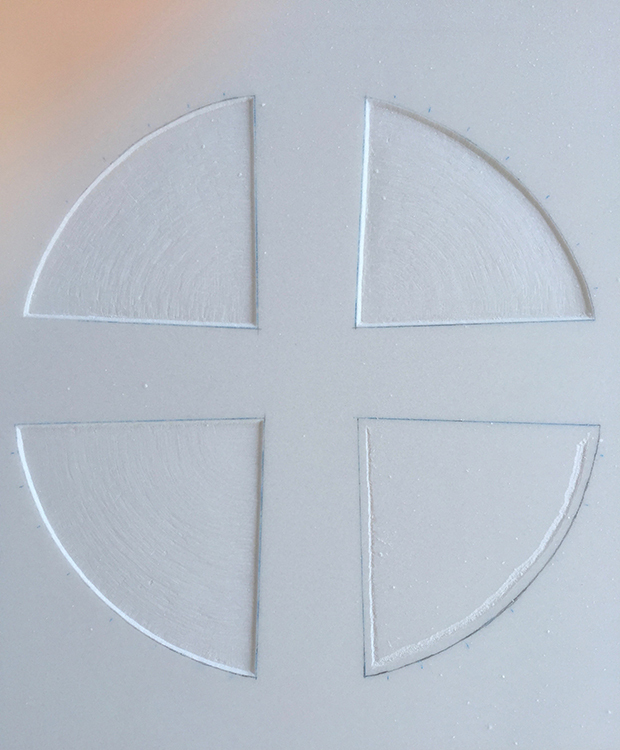 For the cross design, my plan was to carve the surrounding area of the cross a few millimeters deep, and then cut radially. It took me two and a half days to carve the area surrounding the cross and four more days to finish the v-cut radially. 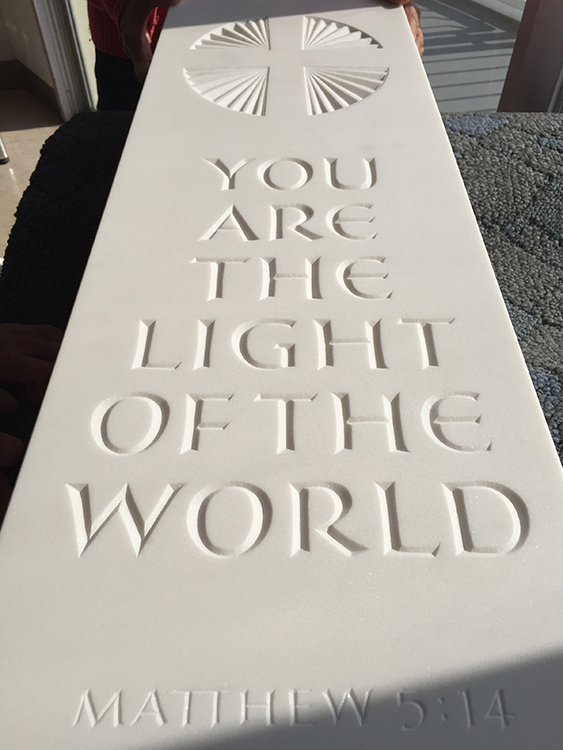 The streaming light from the window made the stone sparkle so beautifully that my heart was filled with excitement every moment despite the physical fatigue. set up on the easel. The stone is still on a table. 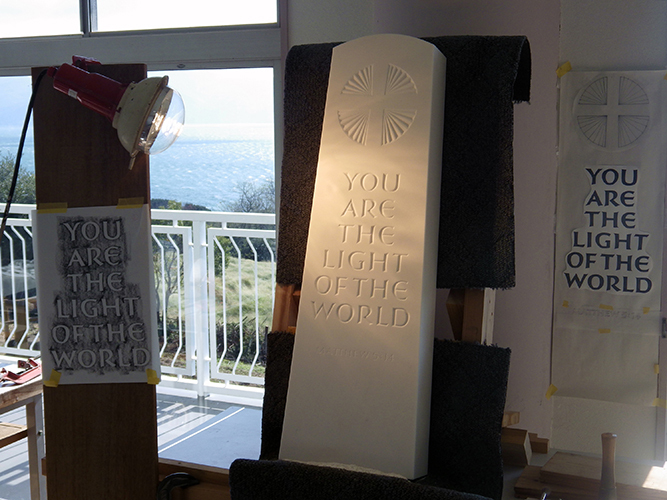 During the consecutive holidays in November, the stone was just about ready to be placed on the easel. 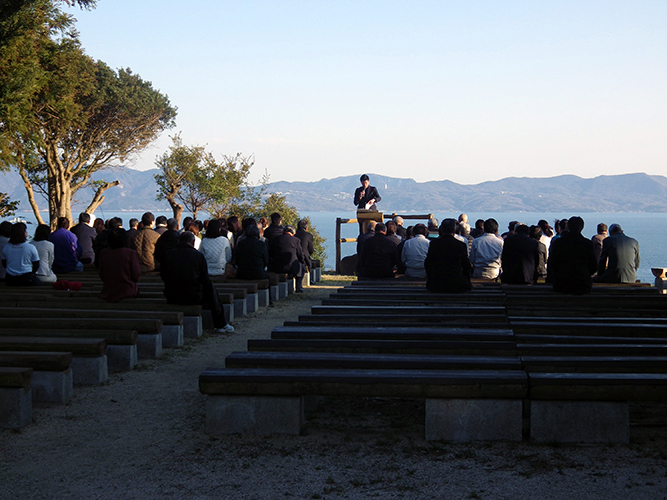 A group of graduates of Keimei Gakuin was visiting Maejima Camp. 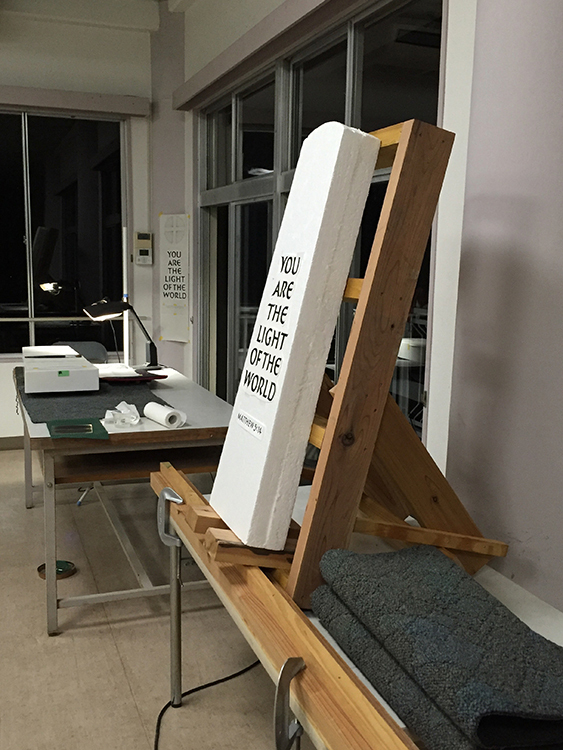 They lent us their hand in moving the piece onto the easel. 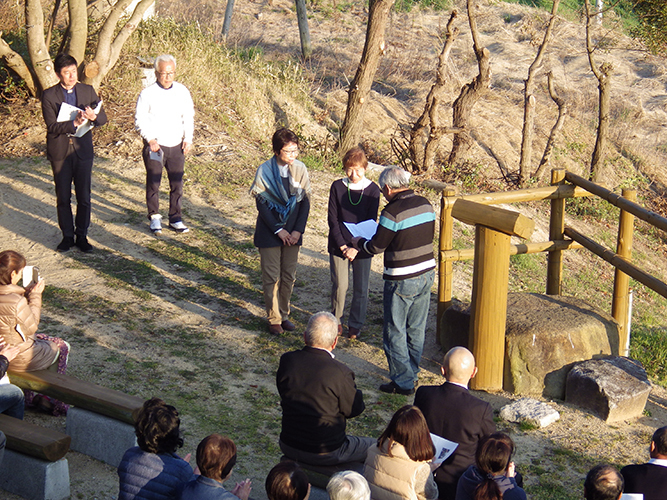 So many people were involved from the day that the President of the school kindly agreed to its erection to the day of the completion of the memorial. My days started with my arrival at my workspace at 8:30 am, going home for a lunch break, and working again until around 5:30pm. 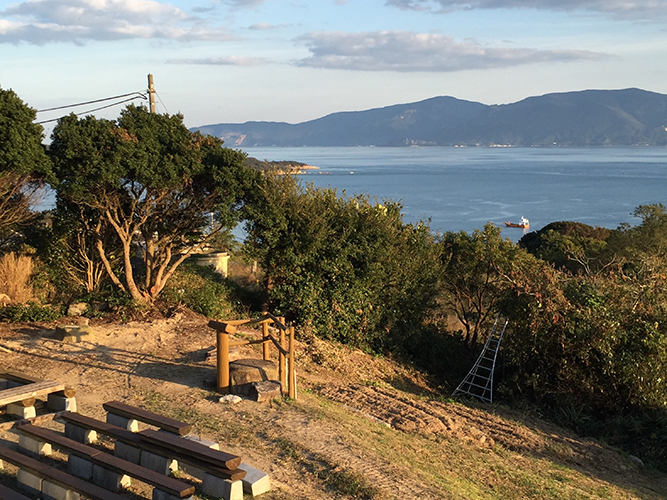 Maejima Camp is located on a hill, and as I mentioned earlier, I worked on the second floor of a building, right beside the Hill of Prayers. It is hard to express in words the contentment I felt seeing the view from the balcony whenever I stood there almost once every hour for a break. 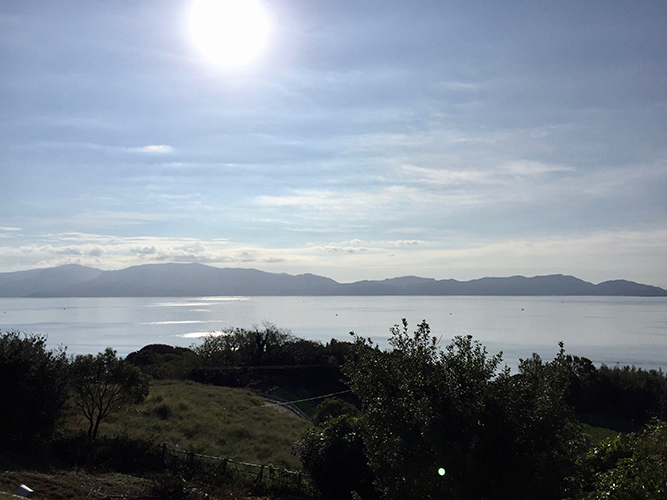 I think it was not just due to the scenery that unfolded before my eyes, but also everything there, such as the pouring sunlight or the breeze. 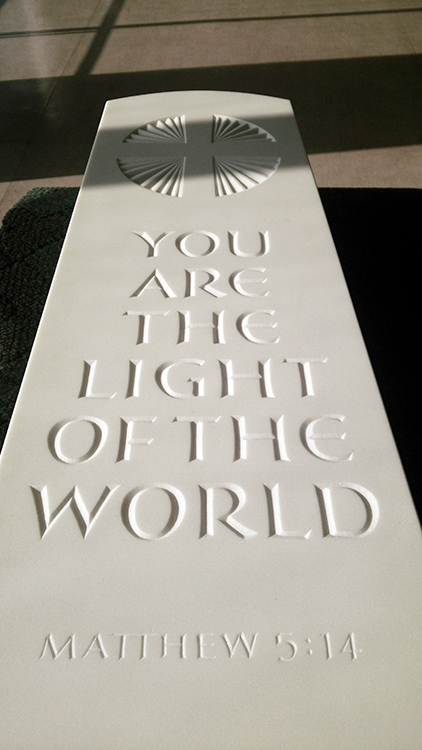 The joy I felt standing on that balcony whilst I worked on the memorial was almost magical. 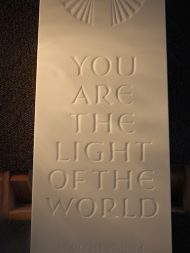 Normally, a letter cutter will begin carving letters from bottom left. For this memorial, that was the small-sized capital M of "MATTHEW". 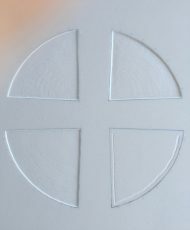 Engraving small-sized letters has its share of difficulties, but compared with the lines on the cross, the amount of carving needed was much smaller. I was ready to begin the body text soon after, and the initial letter was the letter W on the bottom left. 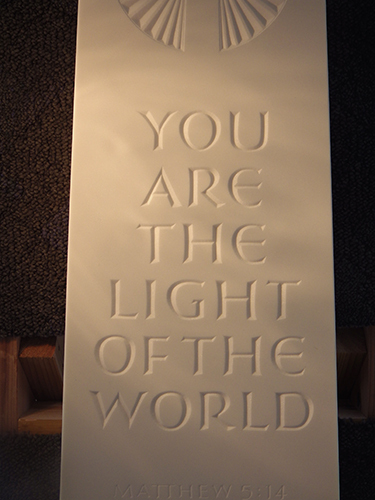 Another problem arose as soon as I started carving, and that was the light. 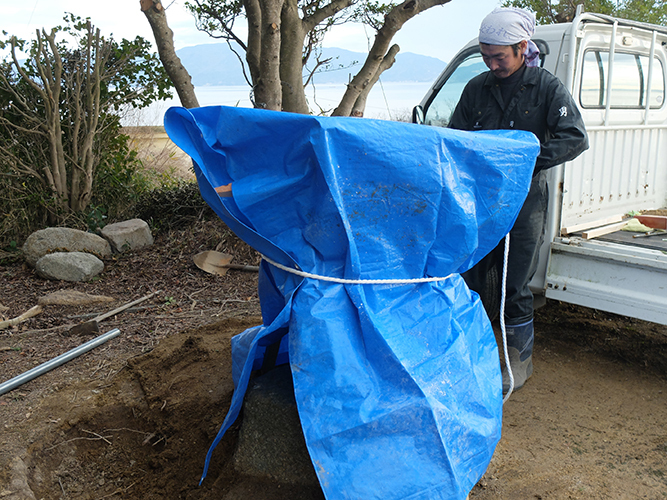 While the stone was laid flat, I had enough sunlight and I could also place a lamp where it did not get in my way. However, the situation changed once I started working on the easel. 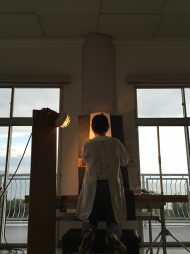 The wall that supported the easel stood in front of me, so I needed a lamp even during the day. I had to look for something that I could clip the light onto at the right height and place so that it did not stand in the way of my arm moving in all directions while I worked. Then, the lamp that I had did not provide enough light in late afternoons so I needed something extra. 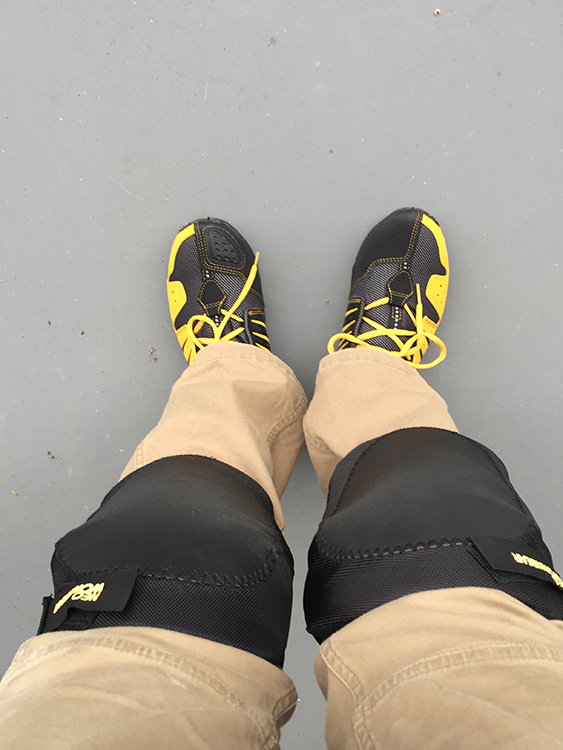 I started to look around, and there it was―a floodlight hooked to the railing of the balcony. It not only provided more light, but it was warm, which was convenient as winter was approaching. I just remembered another episode about lighting. 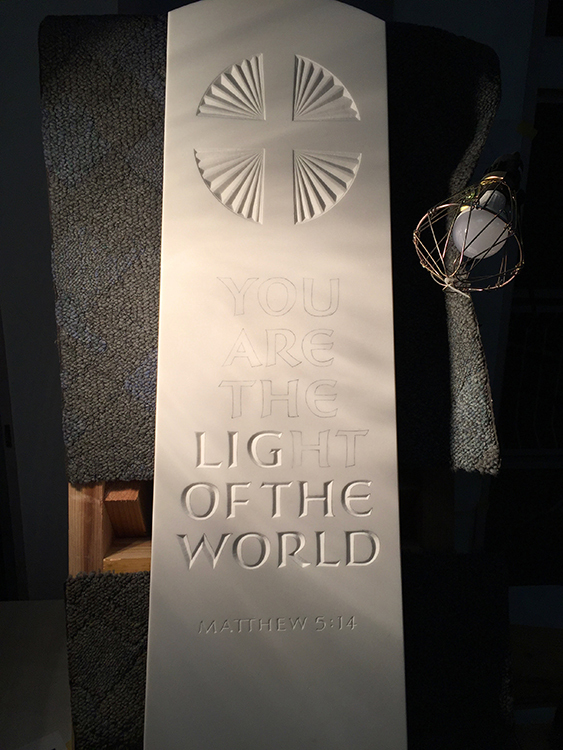 For my convenience while hand carving, I always had the light falling from the upper-left direction. 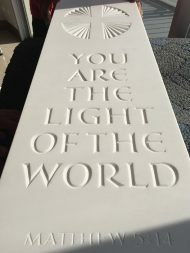 I suddenly realized that I would not be seeing the stone like I was seeing then after the memorial was installed because I was seeing the shadow with the light source from the left side while I carved. 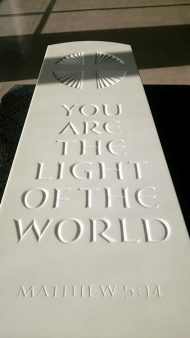 The memorial was to be erected on the Hill of Prayers so that the shadows on the letters would be created by midafternoon sunlight falling from the right side. 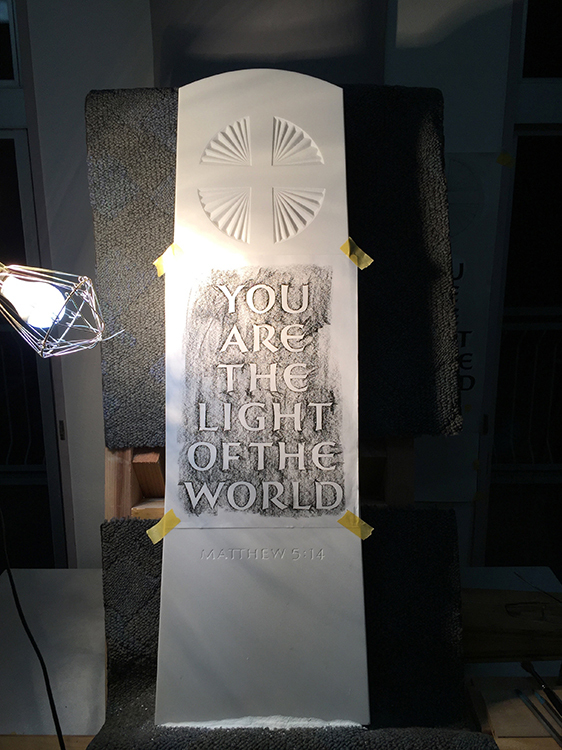 It was somewhat dramatic to think that I was getting to see something that was only possible for a limited time, but I also realized that I needed to check how the stone will look with the light source from the right-hand side. 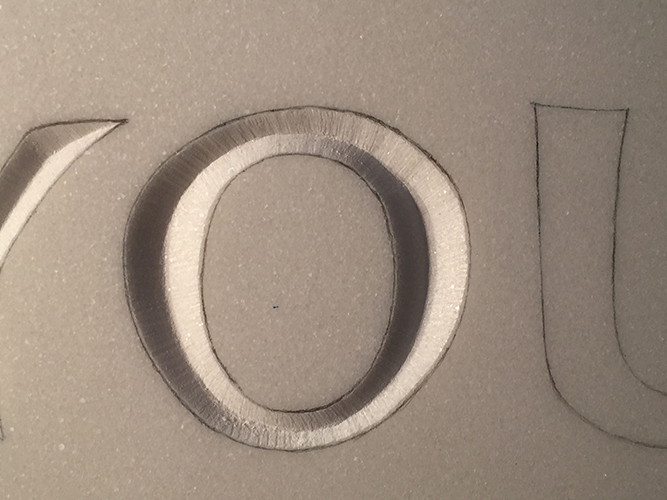 I started engraving the letter W of the body text, and immediately it was like being punched in the face. 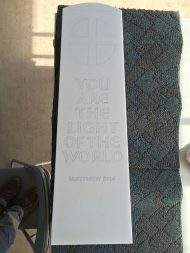 I thought to myself, "It sure does take a lot of time to engrave just one big letter, and W is like carving two V's!" However, tackling a difficult letter in the beginning seemed to make the following task a bit easier. 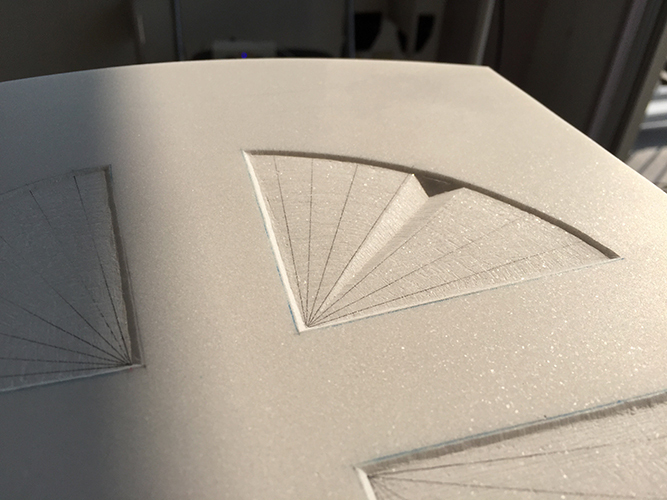 Three letters were the most that I could cut in a day, but seeing a steady progress gave me a sense of accomplishment each day. 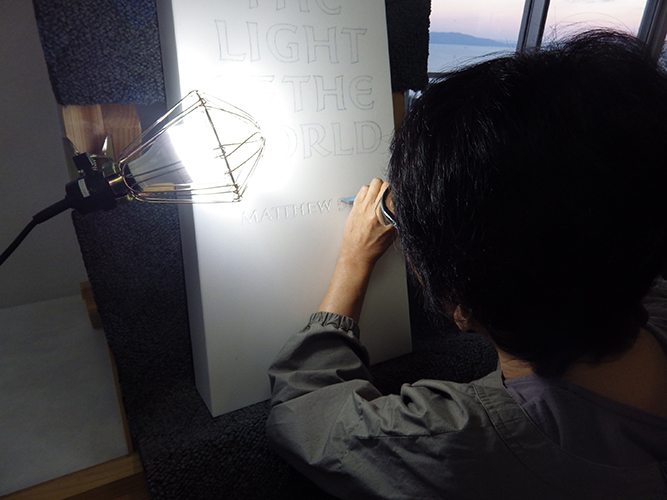 It took eight days to finish the body text, and it was completed on December 4. 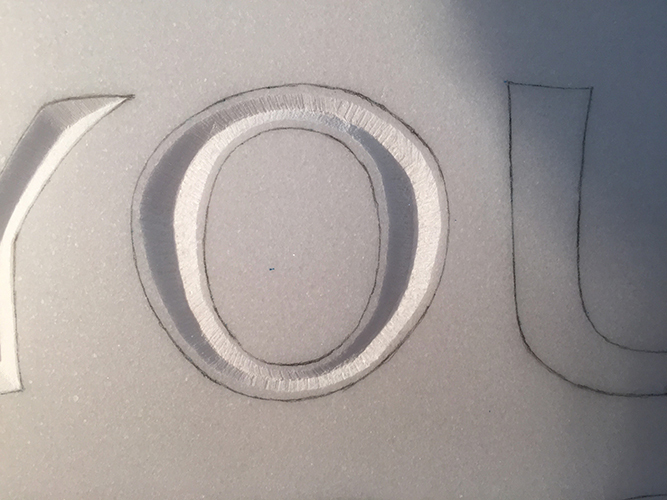 I always feel that it is difficult to know when to stop with letter cutting. The memorial was no exception, and I realized once again, giving up in a good way (knowing when to let go) is important. 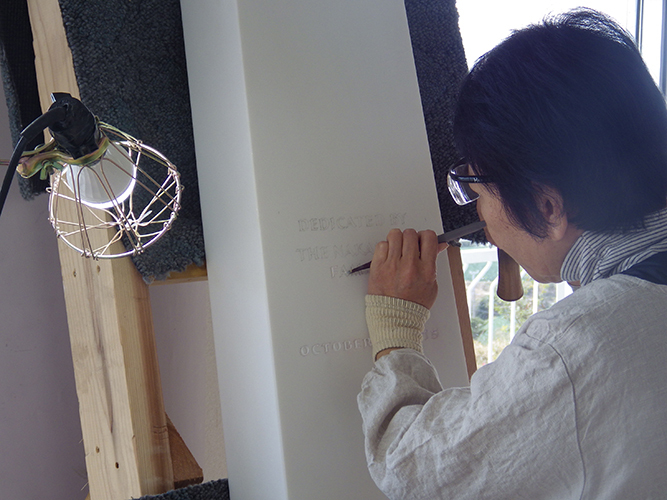 A rubbing is made after most of the inscription is done to check and work on the details. Three rubbings were made to make adjustments for the main text. As we were approaching winter solstice, it was pitch dark around the time I finished a day's work. In a considerably large space, the space with the stone seemed to glow, and just about the only sound to be heard was the occasional mooing of cows in the distance. Posting pictures and explanation in both Japanese and English (although on some days I was too tired to add an English translation) about my daily progress on social networking sites became my routine. It was encouraging to find that many people in Japan and overseas were checking and commenting on them. I once received a question from abroad, "Are you a Christian?" I am not. 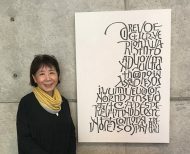 This religious concept may be difficult for non-Japanese people to understand, but although I grew up in a Buddhist home, my grandparents were Christians and we would go to church on Sundays and sing hymns at home. 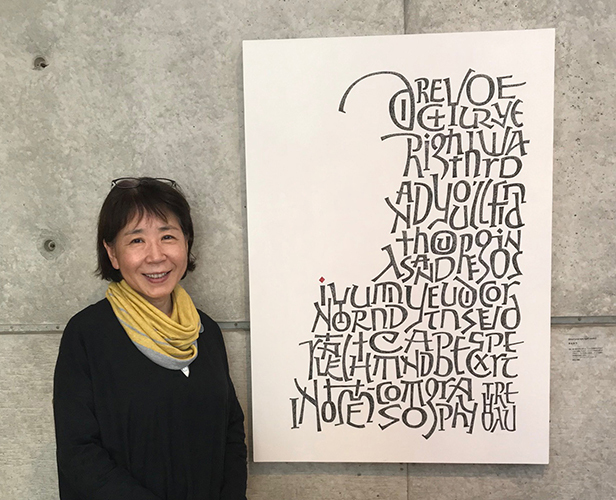 I chose this Scripture mainly because Keimei Gakuin offers education based on Christian principles and the verse expressed the school's spirit. However, the words also mirrored my father's way of life. I posted a pretty simple reply, but I remember feeling relieved when I saw that my reply was "liked". The front is finished. Onto the reverse side. 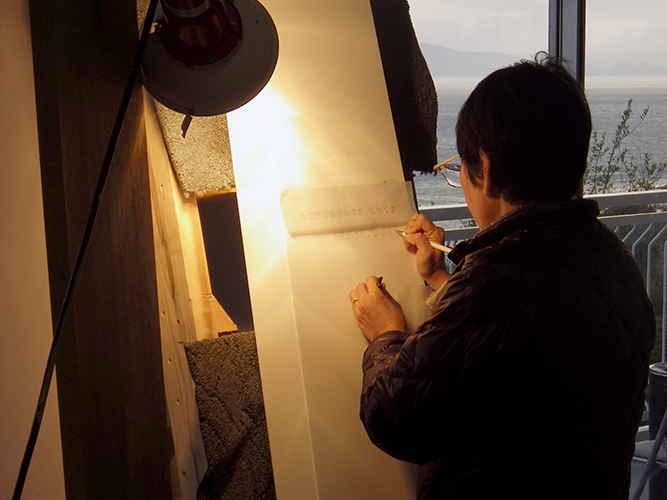 I was in Maejima to work on the final stages of letter cutting on December 27. The President and other relevant people of Keimei Gakuin were visiting the camp that day. While they walked around the camp ground, they were also going to see the progress of the memorial, and there was one problem with this. I had already finished the front side so the reverse side was facing front. I felt that it was a shame that they were going to see only the small letters on the back side. I decided to make a booklet with pictures that I had been taking. 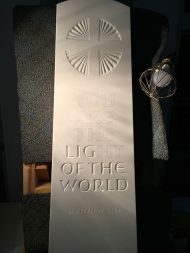 It was a simply-made booklet showing in a chronological order the first stages up to the completion of the main inscription, and titled Toward the Light, comparing the engraved text itself to myself facing the stone with the light falling on it while I worked. 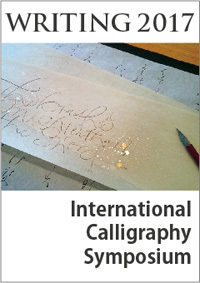 This booklet is now in the library of Keimei Gakuin. 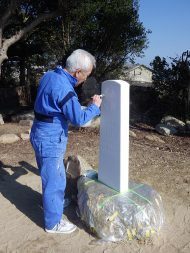 I had aimed to finish before the end of the year, but it was actually January 2, after New Year's holidays, when the memorial was completed. I had spent 25 days in the workplace, and worked for about 150 hours. 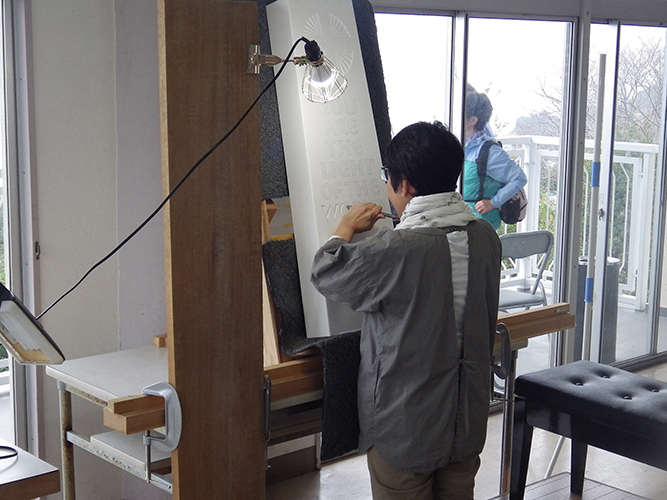 The day after the letter cutting was done, the stone was removed from the easel, where it had stayed unexposed to natural light, to a platform with wheels and placed by the window. 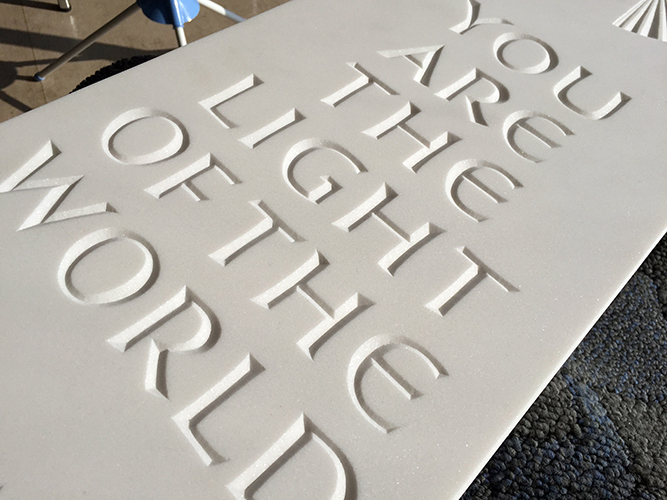 I felt the true value of letter cutting when I finally saw how the sunlight created sharp definition of light and shadow on the inscription. from light falling from different directions were thoroughly enjoyable. 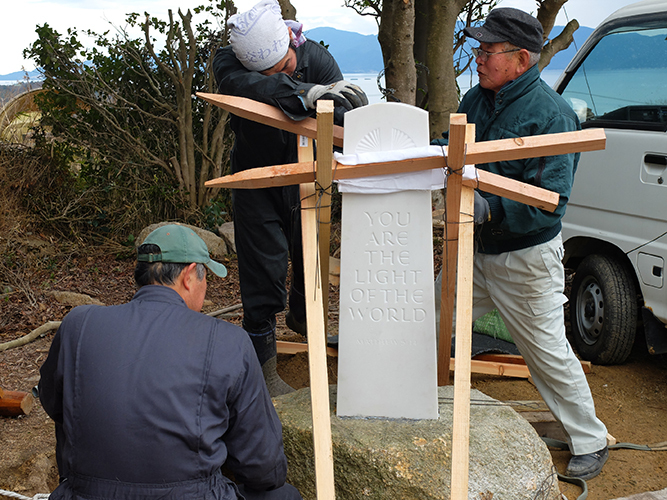 I was thankful for President Ozaki's suggestion that we have an unveiling ceremony for our donation of the memorial to the school. 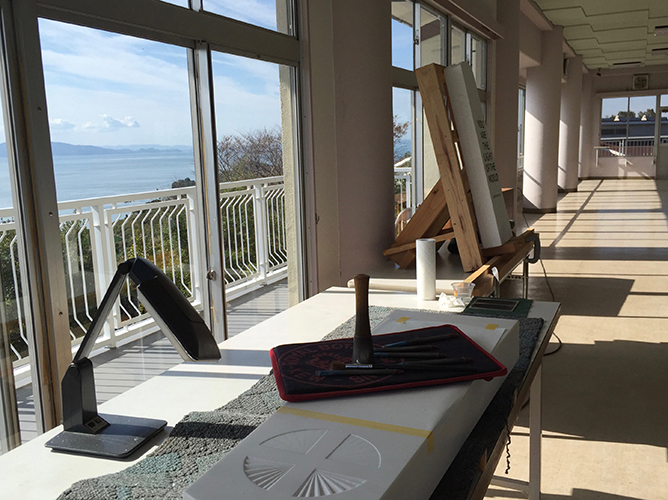 The school holds a "Keimei Gakuin Maejima Camp Appreciation Day" each year and invites residents of Ushimado and Maejima to the facility. 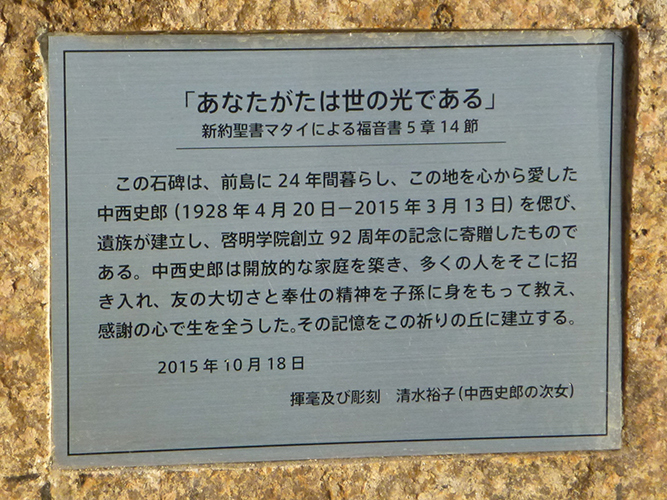 The event would be on March 26, 2016, and the memorial was to be unveiled then. 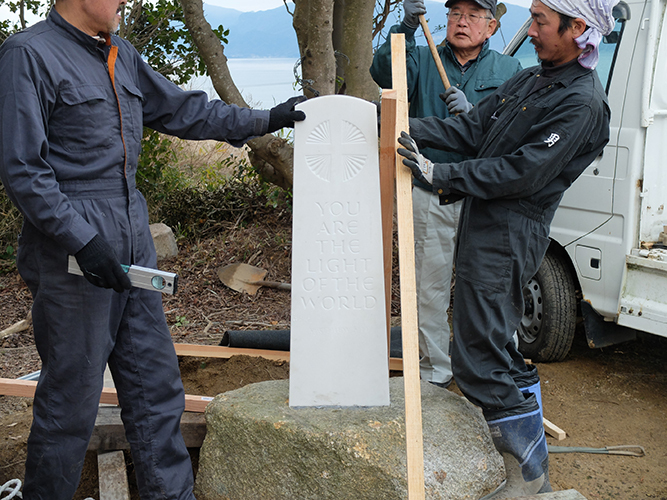 The climax of the remaining process was the installation of the memorial. The memorial was set up on the base stone on this chilly day. I was most interested to see how this was going to be done. 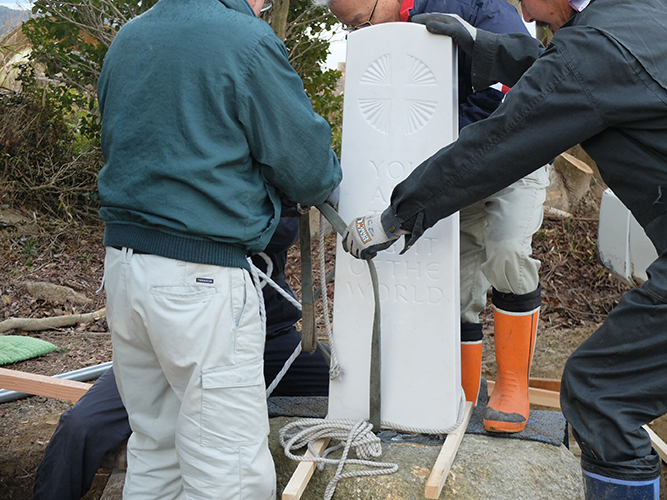 The base was already cut in a size appropriate for the memorial with two metal rods fixed in place. 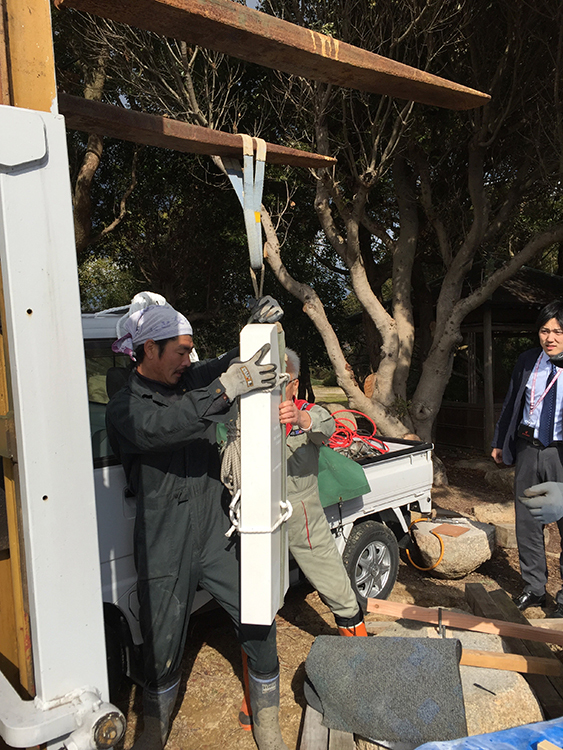 Mr. Motohama was in charge of all the preparation, planning, and supervision of the installation. 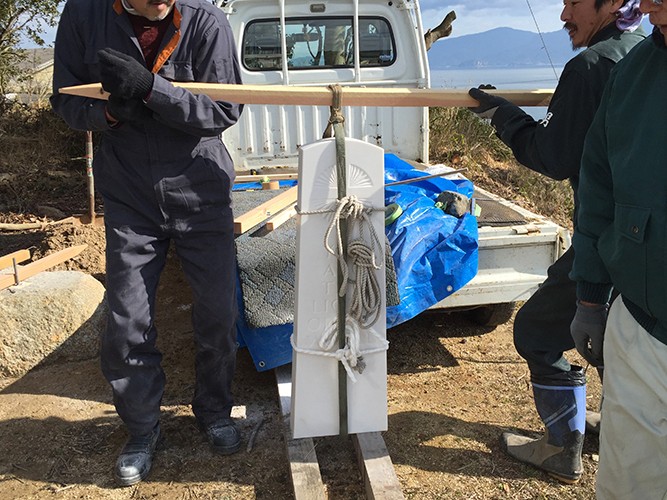 Kuboki, who along with Mr. Ikushima was a great support from the beginning. 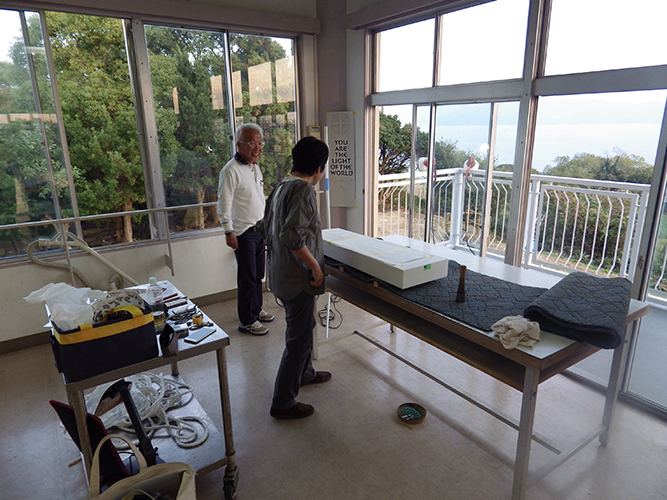 Mr. Motohama making necessary arrangements of the installation. 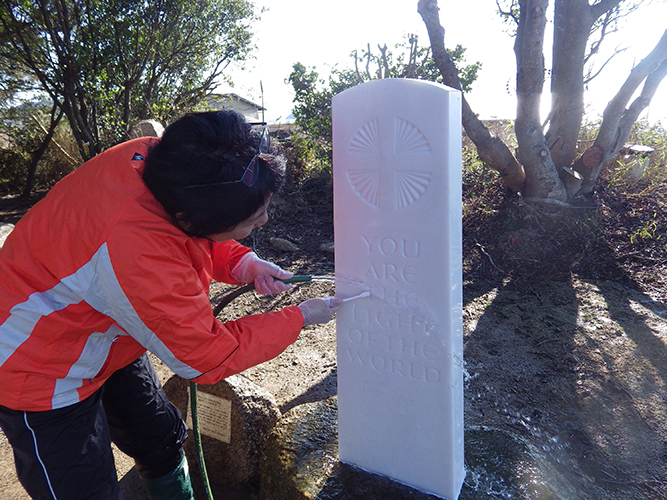 Two holes were drilled into the memorial also. First, the installation was simulated. 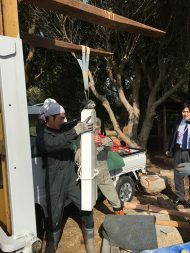 After trials of lifting it using a piece of lumber and a forklift, it was decided that two strong men would carry the memorial using a crowbar and gradually set the stone down until the holes in it fit the metal rods on the base stone. Onto the actual installation. 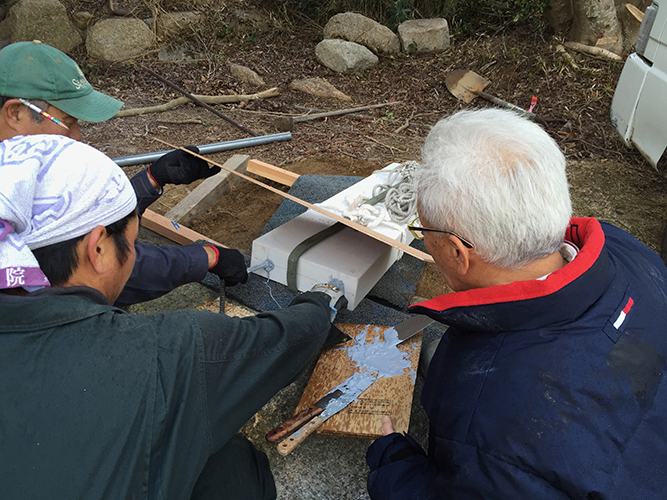 An adhesive was applied to both the base stone and the memorial, and the memorial was set on the rods. 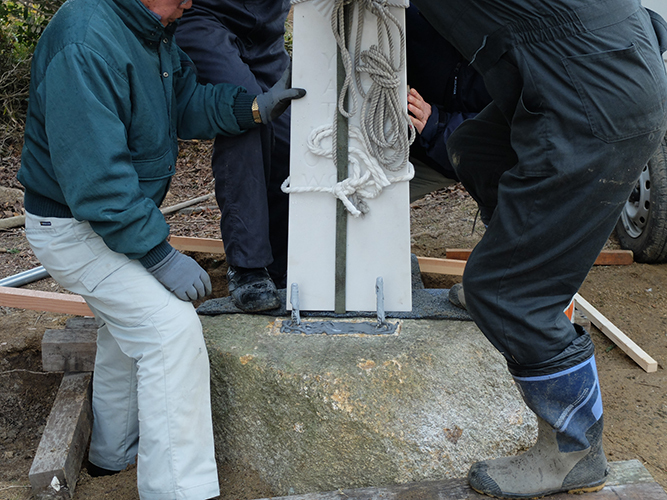 Then, before the adhesive dried completely, a level guide was used to check the position and a wooden frame to deftly install the monument. Before we had any time to admire it, a blue tarp covered the memorial. 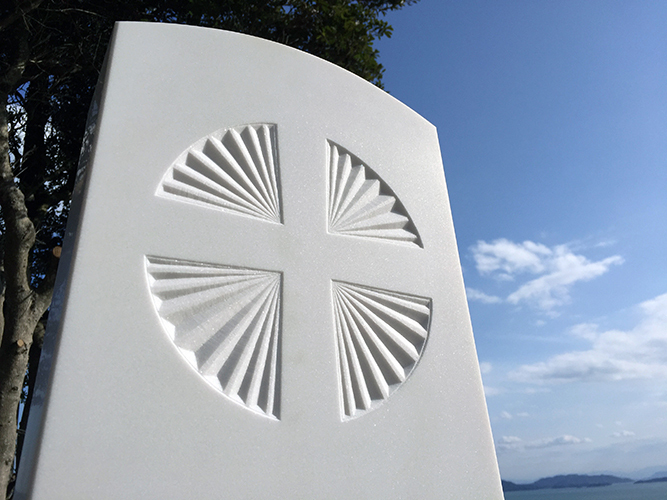 Since the stone was still unprotected, it needed to be protected against rain or salt breeze until the adhesive dried completely and the memorial and base stone glued together. This all happened on a cold day with flurry of snow. 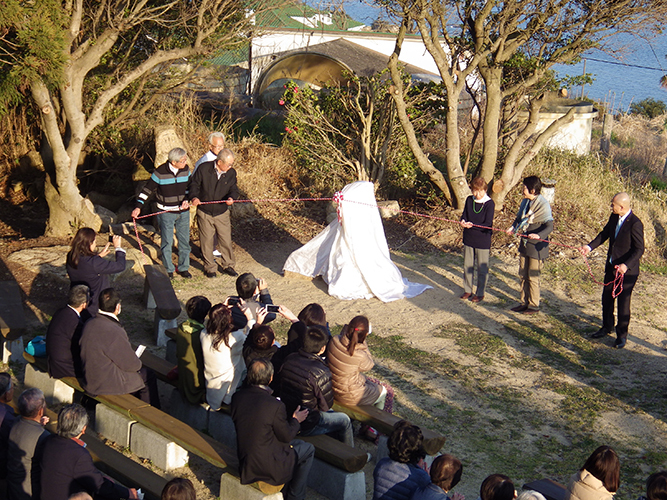 I visited Maejima on February 16, around the time that seemed relatively warm and we would be having sunny days. 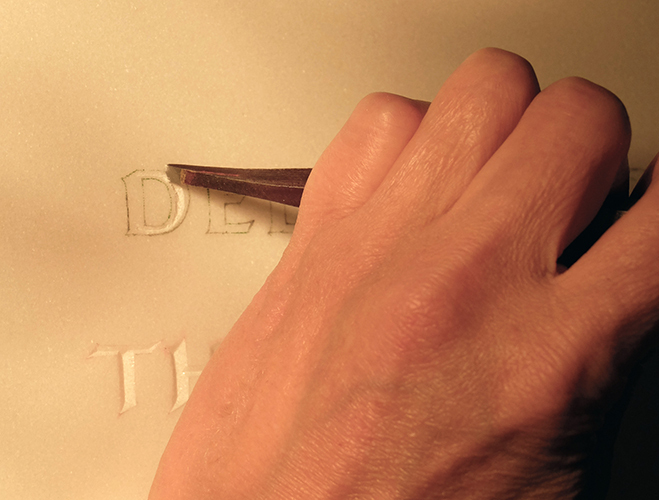 The stone needed to be washed as the carved letters still had stone dust inside of them. A toothbrush was used to remove the dust. 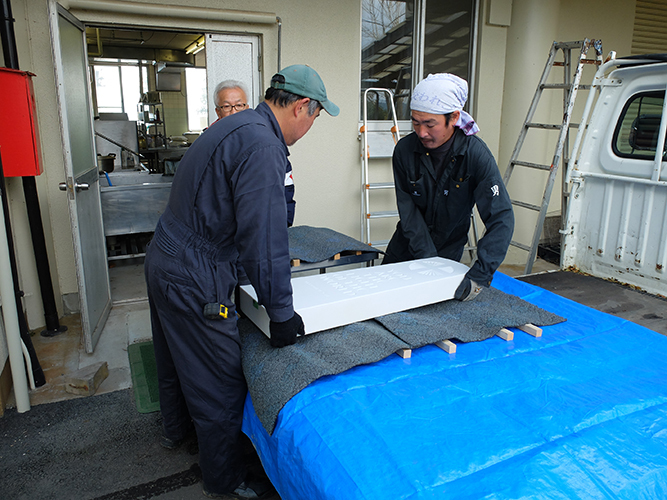 Then after letting the stone dry for a few days, a coating agent was applied. 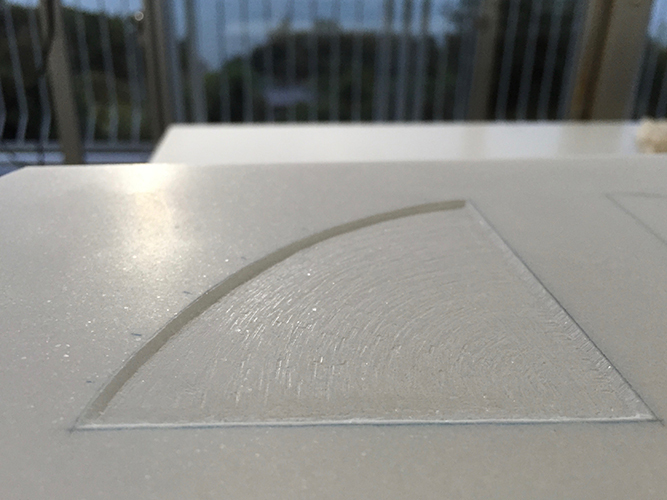 Marble is vulnerable to acids, and we were also worried about freezing damage during winter. 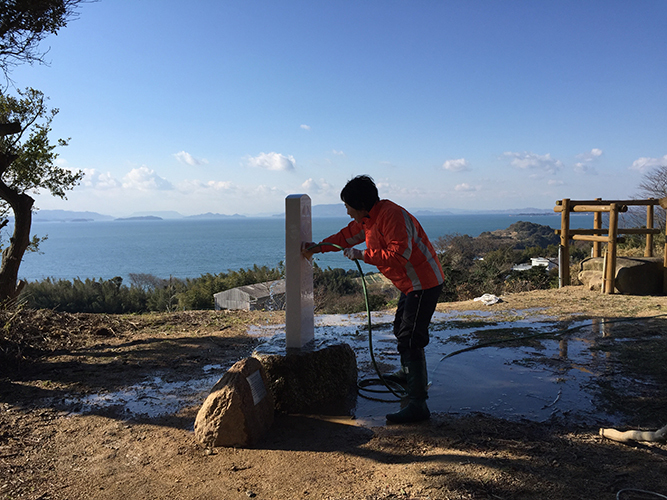 It seems that applying coating agents is uncommon in the West, but the location by the sea and the fact that Japan gets a lot of rain were taken into consideration. to be the president of a paint company. The cherry blossoms were beginning to bloom on the day of "Keimei Gakuin Maejima Camp Appreciation Day". 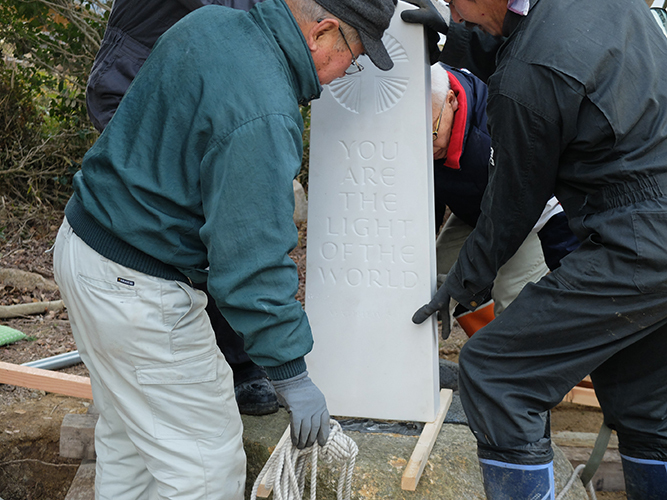 The unveiling ceremony of the memorial took place from 5 o'clock in the afternoon before dinner. 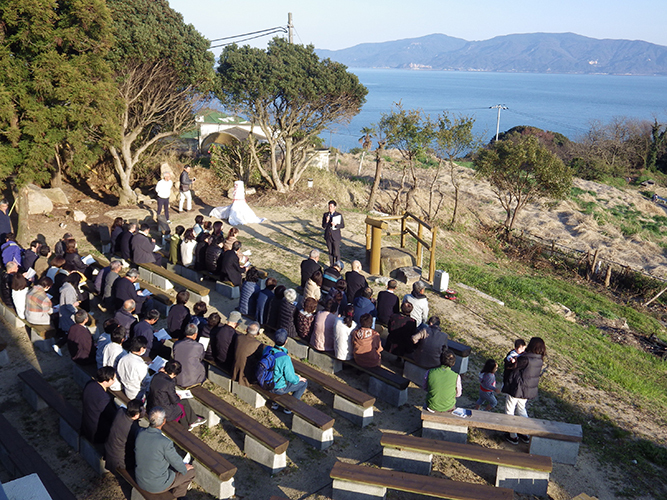 There was an opening prayer and sermon by the school's chaplain, and then the unveiling ceremony began attended by the mayor of Setouchi City. The school also presented us with letters of appreciation. This was just one year after my father passed away, and just six months after I approached Keimei Gakuin about donating a memorial. So many people were so kind to lend their helping hands. There were developments that were accidental or coincidental, all of which seemed like they were led by an invisible power. So this is how the memorial became a part of the landscape of the Hill of Prayers. My father must have been watching us from above with his shy smile, with hopes that many people will visit the memorial and that it will warmly watch over them in return. 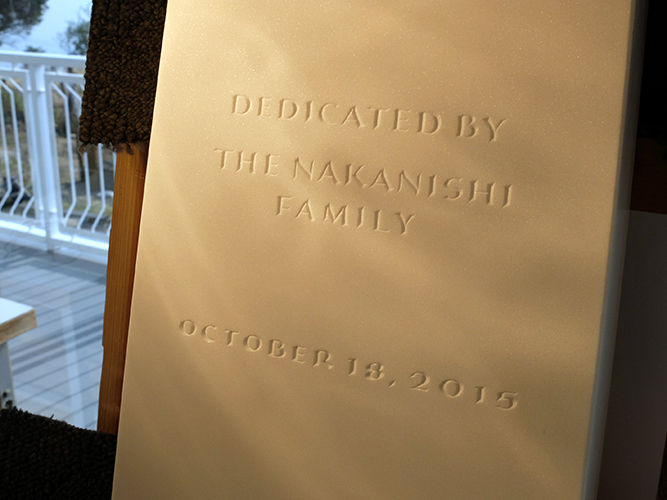 Last but not least, President Ozaki kindly suggested that we add a plate that briefly explains what the memorial is about and what kind of a person my father was. I gathered my courage and thoughts to come up with a short passage. I would like to close this story with a photograph of the plate. firsthand the value of friendship and the spirit of service. He lived out his life in gratitude. 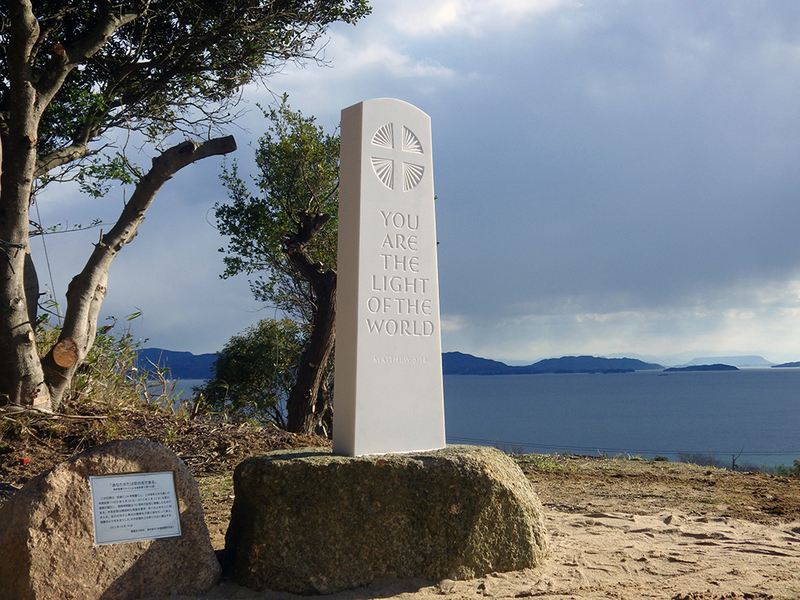 The memorial stands here on the Hill of Prayers in loving memory of him. I would like to express my sincere gratitude to Keimei Gakuin, everyone in Ushimado and Maejima, and anyone who provided me with support.